The trees whose crowns intercept most of the sunlight in a forest stand. The uppermost layer of a forest. The canopy of the Oak - Beech / Heath Forest is populated by American beech and various oaks that are somewhat drought-tolerant ( dry-site oaks ), such as chestnut oak, white oak, and black oak. With its smooth gray bark, American beech presents a striking picture year-round. Its yellow autumn leaves turn tan and cling to its long, horizontal branches well into the winter months, making it easy to spot when other tree branches are bare. Small trees and young specimens of large trees growing beneath the canopy trees. Also called the subcanopy . Young American beech trees make up much of the understory of the Oak - Beech / Heath Forest, along with small trees such as spring-blooming common serviceberry and flowering dogwood. Shrubs, juvenile trees and vines at the right height to give birds and others a perch up off the ground but below the trees. Mountain laurel—a tall evergreen , shiny-leaved, gnarled shrub—is easy to notice in the Oak - Beech / Heath Forest. Look for its bright pink flowers in later May and June, when they contrast nicely against its dark green leaves. Those evergreen leaves stand out in late winter, dotting steep hillsides that are otherwise mostly a collage of browns and grays. You can also find shorter blueberries, huckleberries, and pink azalea (striking in spring bloom). Fall-blooming American witch-hazel and American beech saplings are also in this forest layer . Plants growing low to the ground. This includes small shrubs and tree seedlings . The field layer , which may include striped prince's-pine, partridgeberry, and American beech seedlings , is usually sparse in the Oak - Beech / Heath Forest because of the shade cast by mountain laurel, and the dense root mats of hillside blueberry bushes. Patches of moss often thrive where duff has eroded to expose mineral soil . Read about the handful of non-native invasive plants that threaten this natural community on the Ecological Threats page. Wild hydrangea (Hydrangea arborescens) flowering in June. Photographer: Gary FlemingSome of the rock outcrops in the Oak - Beech / Heath Forest (and some in the Mesic Mixed Hardwood Forest) are occupied by a completely different set of plants (a “miniature natural community” of sorts) that can thrive in almost no soil at all, such as the “hydrangea rock gardens” in Rock Creek Park. This small but notable “community” of plants includes wild hydrangea, growing in the nooks and crannies of scattered rock outcrops. 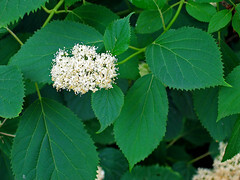 You can see the distinctive white blooms of the hydrangea shrub in the peak of summer, and its toothed, dark-green, egg-shaped leaves the rest of the year. Other plants grow in small pockets of soil within cracks in these rock outcrops—marginal woodfern, white wood-aster, New York fern, and violets, among others. Because of the extremely limited soil, this community cannot support trees, but only small shrubs and herbs. Keep an eye out for isolated pockets of "hydrangea rock gardens" tucked here and there in outcrops of mylonite or Laurel formation bedrock beside Valley Trail on the upslope side, and along the Lower Western Ridge Trail, low on the slope below Klingle Mansion. Map tip: To find these natural highlights, go to the interactive map of Rock Creek Park and search for "hydrangea." 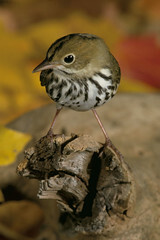 The ovenbird can be heard rummaging around on the leafy forest floor. Photographer: S. Maslowski, courtesy of US Fish and Wildlife ServiceAnimals that use the Oak - Beech / Heath Forest include those that thrive in mature forests with multiple structural layers , including a canopy and an understory of small trees and shrubs. This variety of structures provides ample places for nesting, feeding, and protection. Butterflies, moths, bats, chipmunks and squirrels, and many varieties of songbirds (for instance wood thrush, red-eyed vireo, scarlet tanager, robins, woodpeckers, veeries, ovenbird, and even an occasional worm-eating warbler) may be found here. Likewise, white-tailed deer, raccoon, and red fox commonly use this habitat. Acorns and beechnuts, hard mast found here, are both excellent, high-energy, year-round food sources consumed by much of the wildlife. Many forest animals also consume soft mast that grows here seasonally—perishable berries of flowering dogwood, common serviceberry, mapleleaf viburnum, blueberries, and huckleberries. 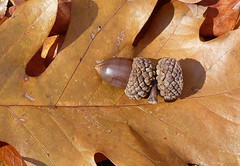 White oak acorns are one kind of hard mast wildlife feeds on in the Oak - Beech / Heath Forest.